I wanted to share a little more of the process. For those of you who haven’t read about our adventures with grapes, Part 1 is here and part 2 is here. On the Sunday before I fell and broke my ankle, the hubs and I re-racked our wine, although we didn’t take any pictures. There wasn’t much spillage, which was a good thing, given we’d already washed down the walls from the unfortunate wine-thief episode. It’s been six weeks since we re-racked, and we’ve been hoarding bottles where we can. 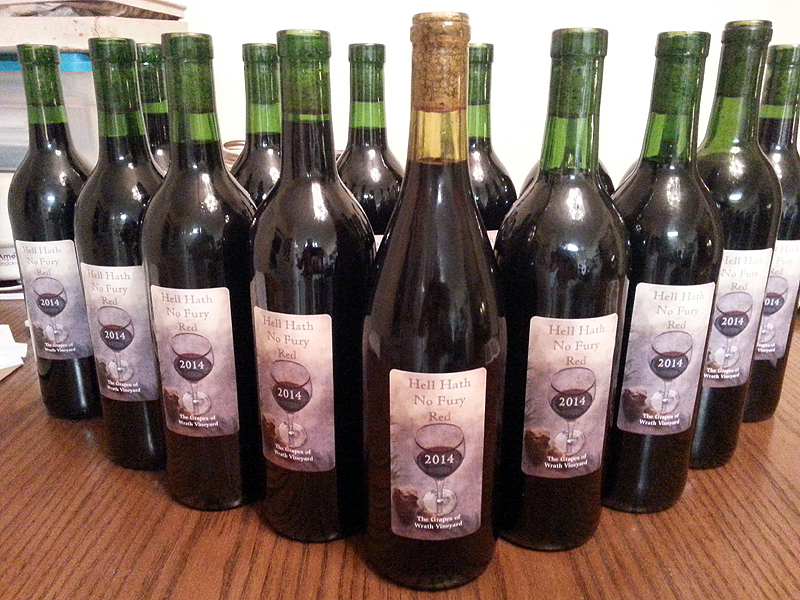 I have been picking up my formerly favorite wine, a Cabernet Sauvignon, and soaking the labels off of the bottles. I took this picture the other night after the last of the labels came off. During the sterilization process we discovered that one of our bottles had a hairline fracture in the bottom of it. As we were filling it with the sterilizer, I noticed a puddle underneath it. Glad we figured that out prior to actually filling it with wine. THAT would have been a serious mess! Per everything we have read, I crushed one campden tablet per gallon of wine and added it right before bottling. This kills any bacteria that could spoil the wine, and also keeps it from turning to vinegar while it sits in the bottles. 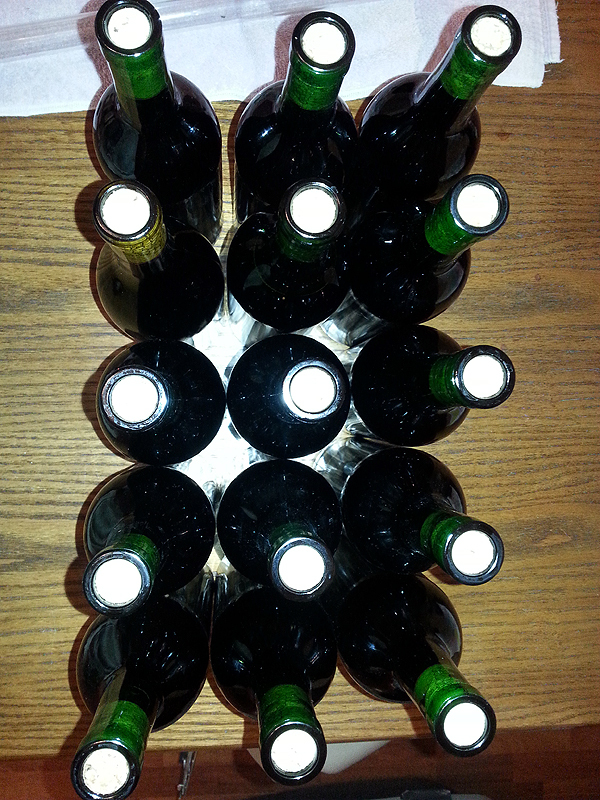 15 bottles ready for corks. 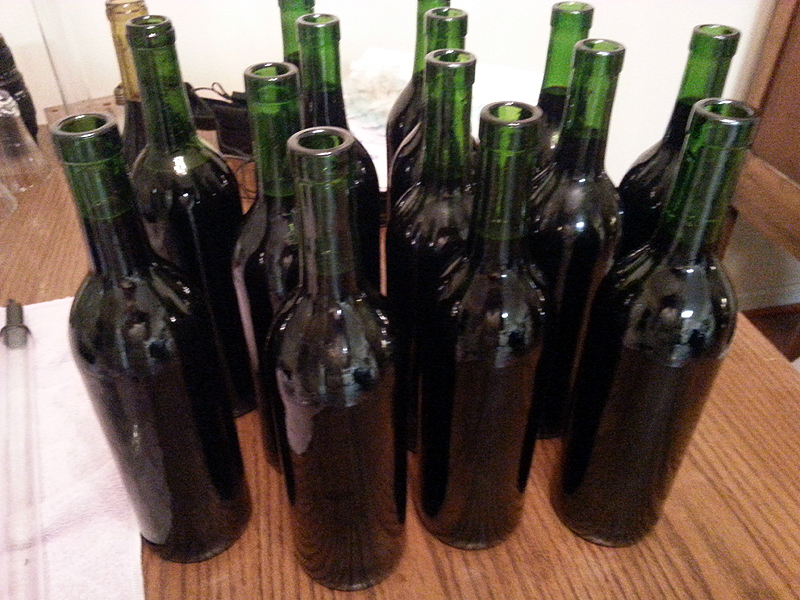 We siphoned all but the grunge (okay, lees) from the carboy and we ended up with four gallons of wine. I am assuming that the gallon loss is from wine-thievery, as well as the loss from the mass of the fruit/hulls, and that which was left over from un-siphoned liquid close to the lees on the bottom. Because we lost a bottle, and also because we knew we would probably be a few bottles shy, we had a couple of one gallon screw top bottles on reserve. We’d grabbed those when they were on sale in case we decided to do one gallon batches, and it was good that we did, as we had a gallon more than we had dark green wine bottles. Bottling was probably the easiest part of the process, and corking was fun, as well, although there was a bit of a learning curve to that. After everything we’d read about corking, we steamed our corks for about three minutes and pulled them out of the water as we needed them for the first three bottles. The first one went in beautifully. We have a double-lever corker, which was surprisingly easy to use, so after corking the first of fifteen bottles, we figured the remaining fourteen would be gravy. Not so much. The second and third bottles we corked saw the corks easing their way out of the bottles. WTH???? I jumped online and couldn’t find ANYTHING that would explain this. At first we thought that perhaps the corks were too wet and/or there was a lot of oxygen coming from the wine. I pulled all the corks out of the water, let them dry and the third, fourth, and most of the remaining bottles corked beautifully. Then the thirteenth and fourteenth bottles’ corks slid back out, as well. We noticed that both of those bottles had wine a little higher than the others, so we poured a bit out of both, and they corked well. Learning curves; they’re a great thing, yes? 40 labels for under $20. Can’t complain! 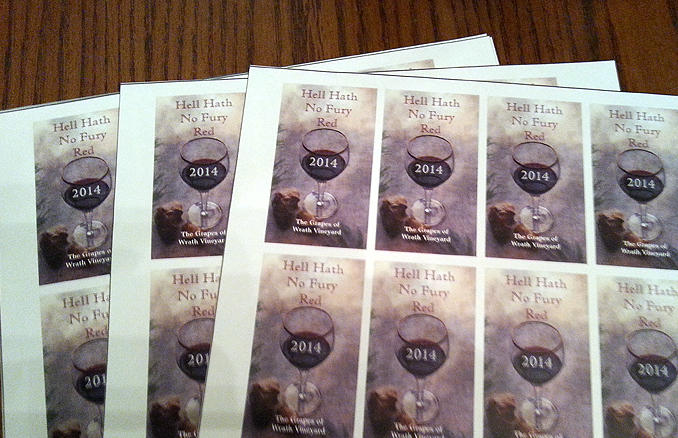 I’d ordered labels from Zazzle and they came in just the other day. I had more fun sticking labels to the bottles and setting them up for a picture, because, OMG, y’all! We made wine! So thus ends my first adventure in wine making. We have the other half of the crushed grapes in the freezer and will be thawing them out for the next batch, which will be a sweeter blend. I am open for suggestions for a name for the sweet red, so if you have any suggestions, we are looking forward to seeing them! I’d also love to hear from any of you that have had your own adventures in winemaking or home brewing. 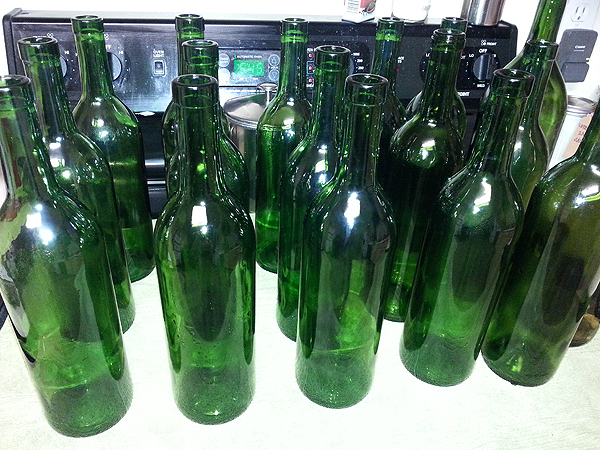 This entry was posted in DIY, HomeMade, Life’s Little Victories, Wine and tagged bottling wine, corking, corks, DIY, do it yourself, homemade wine, wine, wine making. Bookmark the permalink. Oh, man, is it good! It’s dry, which was what I was going for, has a really robust noble grape flavor that will pair beautifully with dark chocolate, a nice steak, or a tomato-based pasta dish. Sounds yummy! Nothing like a deep, dark, delicious red wine in the winter! Double post, or are you trying to make a point? It’s dry…really dry….Hell hath no fury and stuff….